Thank you Sir. I have always admired your work, so I take this as a big compliment. First of all let me say that it is extremely difficult to judge the original quality of historical leather pieces. 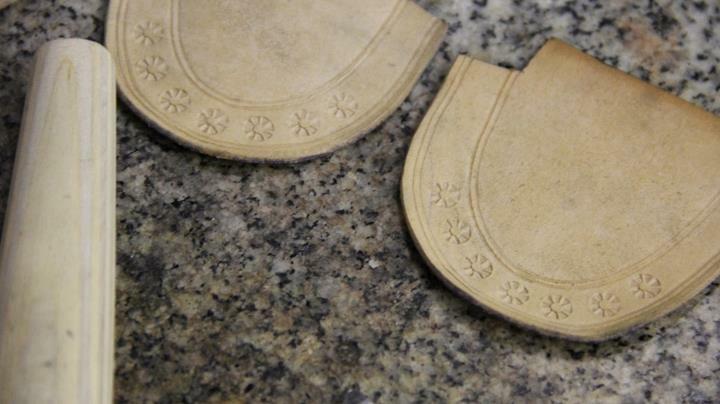 If traditionally tanned leather is not maintained, it shrinks and becomes brittle. So the original thickness and rigidity is close to impossible to evaluate, even with some pieces having survived the centuries quite well. I don't know about any lining, however, I have seen an example of the tubular type in the Hofjagd- und Rüstkammer Museum in Vienna that has fine stitching running along the bottom edge. So it may eventually consist of two layers or the stitching was added to make the chape mouth stiffer and prevent it from widening. With the tubular type having to go over the scabbard mouth, we can assume that it was usually fairly stiff. Otherwise it would have been a pain to sheath the sword after use. With the flap type it is harder to say but I cannot recall a depiction where the flap folds back onto the sword hand when the blade is being lifted. 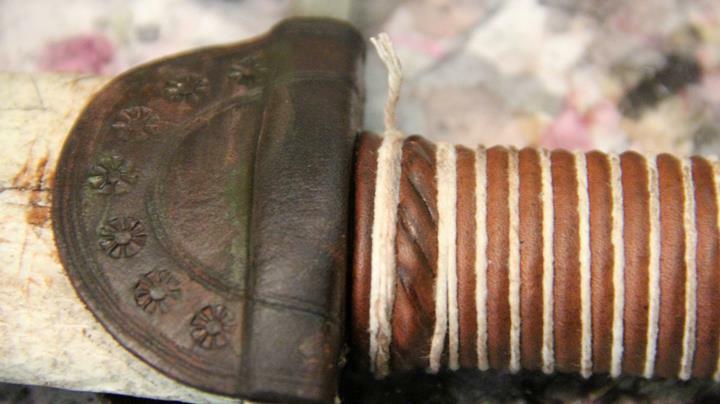 The tiny flap extension of the grip leather, which is not always depicted in art and, IIRC, does not appear with all extant examples, does not necessarily have to be stitched to the crossguard chape. Peter Johnsson told me that when he examined the Munich sword, he noticed that this miniature flap was not in any way attached to the crossguard leather. What looks like stitching in the photos of that sword is just very fine tooling. This is why I did not stitch the grip extension to the chape on my Albion Squire. That does help, in fact. Thank you! I dimly recall Peter Johnsson saying something about some chappes having an inner layer of untanned leather that would be quite hard when dry. I think there was something about that in the Ljubljana thread (IMO, the greatest loss in the recent myArmoury.com catastrophe). The single layer of top grain, veg-tan leather I've used for my chappes was stiff enough to hold its shape and present no problems inserting the sword into the scabbard. I'm glad to know that not all chappes were stitched to the grip extension. That's a pain to do. FWIW, here are some of the chappe images from the late, great Ljubljana thread. I don't understand the need for construction in quarters rather than as a single piece (unless the chappe replaces a damaged original). I make mine like a tunic. What are your thoughts on that? ...My current guess is that, if you train fencing on foot on a daily basis and have neither expensive gloves nor a squire to clean your stuff, a simple and easy to make item like a crossguard leather would effectively prevent your crossguard and the base of your blade from stains that your sweaty fingers would leave. The original drawings found, also ones posted in this thread, do however clearly show nobility, even religious men of power, wearing a sword with 'rain guard'. I would therefor not think your statement seems quite right,having no gloves would hardly be the issue, or the money to maintain a squire. Infact, as even some women of nobility are shown with a sword with 'rain guard', I would not think sweat is the practical issue. These were 'modern' times. The upper class defining themselves to a high degree, a political show of wealth as much as lifestyle wise. No, I don't know the initial reason that 'rain guards' were created either.. but I do think that they existed for a longer period for the same reason that we are making them now.. 'fashion'. Nobility decorated them as much as the hilt or scabbard. Common soldiers or -men had them in more simple, matching leather, etc. What you said though, about the change in how swords were worn -more vertical..: what if this position would actually let more water get ino the scabbard? Thus creating the actual need for a rain cover. To protect the wood core, if not the blade..
"Is that your main gauge under your cloak? Or are you just happy to see me." I think the original type might have been of the flap type. If the tubular type evolved out of this one, than the small flap we sometimes see protruding from the grip leather might just be an atavism. There is, in fact a transitional type that I have seen on a number of period depictions. I am fully aware of the fact that crossguard leathers were not a feature exclusive to the common soldier's sword only. I am offering a thesis for the original purpose and the reason why it evolved in the early 14th century. That any functional device might become a fashion item and would be decorated to the taste and budget of the wearer is out of the question. Sweat is an issue as I can attest to from years of training experience. And a good scabbard serves its purpose of protecting the blade even in rain, regardless of the angle it hangs from your hip. Yeah. Heck, you don't even have to be particularly sweaty, just any old skin contact can stain and corrode high carbon steel. The fats and salts found on healthy skin can quite literally etch a fingerprint into a blade overnight. I've seen it often enough to get perhaps a little paranoid with my shinies. It's seriously much more significant and waaaaaaaaaaay more frequent a problem than rain. So, yeah, I can buy the "sweatguard" theory (which makes the chappe interestingly analogous to the necktie, originally introduced to protect shirt collars from sweat and shirt fronts from food and eventually turned into a purely decorative element). FWIW, it's the primary reason for me to make them. I have small question. Have you seen rainguards with langemesser/bauernwehr? Maybe you know something smaller? Normal, typical one-hand messer. Almost everything I've seen in the single hand size (and most of the larger ones, in fact) feature a nagel or side ring rather than a chappe. We might consider that supportive of the theory of the defensive/protective purposes of the chappe--i.e., if you have a nagel, you don't need a chappe, and vice-versa. It's worth noting that the utilitarian hauswehr/bauernwehr might more often have been exposed to the elements. If any weapon/tool could have used rain protection, it seems like they'd be a good candidate, and yet I don't recall seeing a single knife chappe in artwork of the period. I'll keep looking! The uhm, half-circle stroke is attached over the tubular part, aswell as over the lowest part of the grip leather it seems..
Can one simply glue a leather piece on top of the grip leather like that? Or would it too easely come off due to friction when handling the sword..? That is quite a unique Messer! I don't think I've ever seen one with a spear point before, and is that a tubular handle?! Yeah, there are some like that. The grip is another variant of the knife type--two scales secured by rivets--but some of these were also wrapped in leather, which appears to be the case here. Peter Johnsson has mentioned seeing wooden rivets on one example. I am not sure. I cannot recall a nagel protruding from a crossguard leather. A detail I think I wouldn't have missed. If the crossguard leathers were indeed originally designed to protect the base of the blade from constant contact with fingers or sweaty gloves, than it would not be required for a langes messer that sports a nagel. While at fencing my gloved thumb leaves stains on those of my single swords, that do not sport a cross guard leather, this is not the case with my langes messer. Because of the much longer grip and the nagel, my hand is a notch further down the grip as compared to my swords. This is exactly the sword that Peter Johnsson refered to when he told me that, according to his examination, the tiny tooled semicircular flap is actually part of the grip leather. It is not connected to the crossguard leather underneath, which must have been mounted prior to attaching the grip leather. So it is not a third part put over the chappe and grip leather. 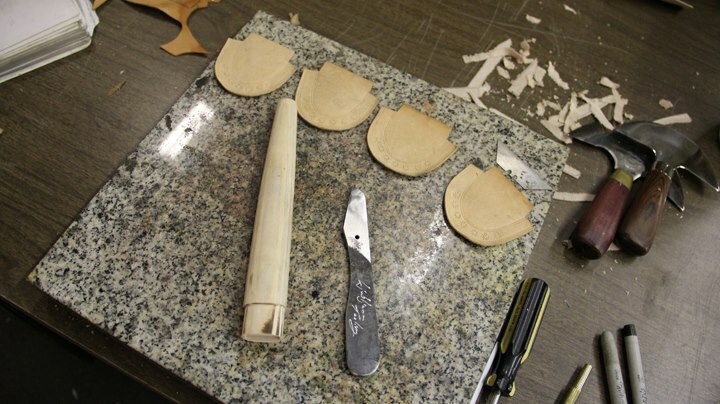 How long it remains in shape and place very much depends on the materials you use and the quality of your glueing job. But considering that, for instance, Albion grip leathers are glued on and do not tend to come off despite heavy use, it would certainly be worth trying. There are some strange "rainguards" out there for sure. These are from the Hofjagd and Rüstkammer in Vienna, Austria. 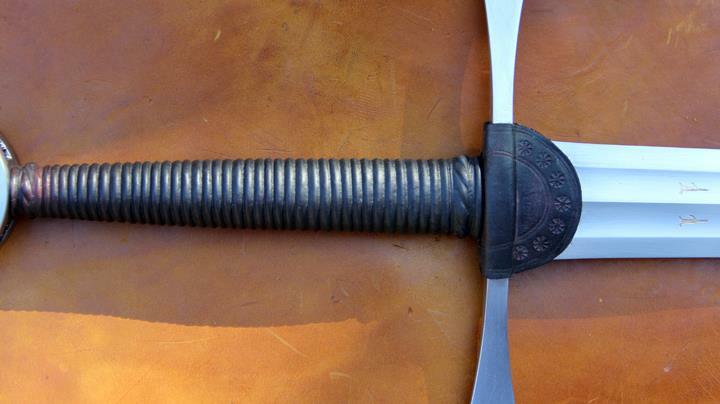 an interesting Panzerstecher / estoc with a tubular rainguard made from metal.